Ali Aman has a background in Chemical Engineering and currently works as an Environmental Inspector at the Supreme Council for Environment. 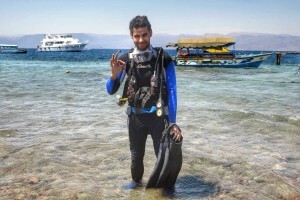 He is also a Professional Association of Diving Instructors (PADI) certified Scuba Diving Instructor and an Emergency First Response (EFR) Instructor. In between his work at the SCE and his intrigue as a diver, Ali has participated in many marine projects and studies. During his underwater expeditions Ali takes vivid underwater photos, many of which are featured throughout bnature.